Welcome to Cycle New England! 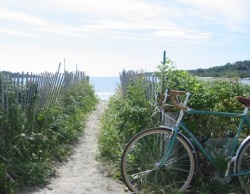 Southern New England is a cyclist's paradise of charming villages, farming communities and spectacular coastline in Connecticut, Massachusetts and Rhode Island. We have created bicycle routes to bring you through one of the last places on the east coast with vast areas of preserved open space. You'll meet artists working out of historic sites and farmers growing fresh produce. We can provide options to include paddling on rivers that have driven mills during the industrial age, or hiking though protected forests. At night you will be welcomed into charming B&B's after enjoying meals that reflect the region's local specialties. Our bicycle tours can be customized to meet your needs. We enjoy adding a day or two to the tours below, or finding the perfect place for a small group to stay, adjusting the daily cycling mileage, and providing luggage transfers to free you up to travel lightly. A self-guided tour with thorough route descriptions allows you to be independent and to travel at your own pace. Our self-guided bicycle tours do not have set start dates so that you can select when to begin and end your tour. We can also provide a guided-tour service for an additional charge. Finally, this is our home. We know the great back roads, the secluded swimming spots and the interesting people with stories to tell. A cycling tour allows you to see the world one pedal at a time and to renew your sense of adventure. We hope you will join us to see our fascinating region of New England.